Build a real estate empire! 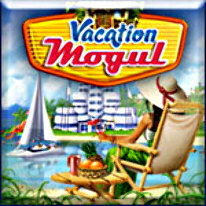 The tourism business has never been easier or more fun than in Vacation Mogul, a real estate management game that challenges you to make more money than you ever dreamed possible. You'll become one of the rich and powerful as you buy and sell land, turn bungalows into ritzy hotels, and build specialty shops and other attractions, all with a click of your mouse. Just be sure to keep one eye on your resources and the other on your bottom line!